Well now, this may just look like Biggie is abducting her arm. But imagine instead of her arm hanging at her side and lifting up and away from her side, which would be abduction, that Biggie first raises her arm forward—i.e.,flexes her arm—and then moves her flexed arm out to the side; this combination move is horizontal abduction at the shoulder. Horizontal adduction is when the flexed arm returns to front and center, and a bit beyond as pictured is horizontal hyperadduction. Because your shoulder and hip are both ball and socket joints, you can "rotate" your arm and your leg through this whole series of movements: flexion, horizontal abduction, abduction, horizontal (backwards) adduction, (backwards) adduction, and extension. This is not actual rotation though, that is coming up next. This cone-shaped sequence of movements is called circumduction, and demonstrates the great range of motion at your shoulder and hip joints. I mean, your elbow does not do this. 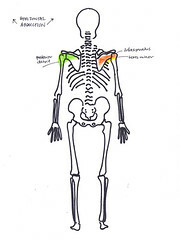 The muscles that horizontally abduct your upper arm are your posterior deltoid, infraspinatus and teres minor. The muscles that horizontally adduct your upper arm are your middle deltoid, coracobrachilis, pectoralis major and latissimus dorsi. 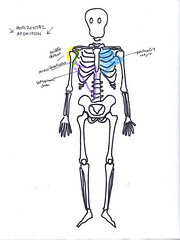 Not specificlly covered in the book, but you can see here that fly-type arm exercises would work the muscles involved in horizontal abduction and adduction at the shoulder and also those involved in abduction and adduction at the shoulder girdle—serratus anterior and pectoralis minor, trapezius and rhomboids.